“I can’t even imagine what it was like to live in the 1920’s. Grandma did. It would have been tough. We are more than a bit soft in 2013. We complain if we get in a sweat, we complain when there’s a weak WiFi signal…. Looking at the words of the hymns and her favorite verses she that she chose today, I know that underneath her smile, her calm exterior and absolute selflessness, there was a whole lot of pain in her life. How do you put a whole lifetime into words? Well Grandma has. She has through these words. Grandma WAS a good person. We all loved her. We can’t think of a single enemy she made. But being a good person does NOT make you acceptable to God. Being God’s child makes you acceptable. Grandma would have told you that she had her own insecurities, her own doubts, her own fears, her own sin. But none of these things could have separated her from God. Which is a good thing, because none of you are saints either. And all of us will end up in a box like this one at some point, but when you are a child of God, nothing can sever that relationship – it’s stronger and more enduring and more gracious than even the best parent / child relationship here on earth. Nothing can get in the way of God’s love for you, not your addictions, not terrorism or hate or that thing you did when you were 12 or 17 or 23 or last week, not dementia. NOTHING. It was hard watching Grandma lose her mind. Many good Christians worry if they will curse God or say something that will jeopardize the salvation while they suffer. You don’t need to worry. Because we don’t hang on to God – our eternal fate doesn’t rest on how good we have been, but God hangs onto us. God hangs onto us for dear life when we have no more strength to hang on. So people of God; quit trying so hard to please God. Just relax, knowing that God has established a relationship with you and nothing will separate you from that relationship. It’s didn’t matter so much that Grandma loved God, the point is this – that God loved Grandma. I was very lucky, at Seminary, to have been handed an assignment in my 3rd year. I was to interview the most spiritually mature person I knew. I interviewed the lady that lies before us here. I want to let you know some of what she told me. confirmation lesson, that she “heard about it after”. She told me that her parents were a loving couple, and she always hoped that she would have the same, which she said she did. Prayer was incredibly important to Grandma. Her parents taught her many set prayers and they sustained her throughout life. Though Grandma wasn’t stuck in 18th century spirituality, she loved how the next generation taught their kids how to pray using their own words out aloud. I think she was silently wished she was better and more confident at praying aloud with her own words. She preferred to pray the Lord’s Prayer in German – as it meant more to her, yet, Grandma, as always – thinking of others, – she admitted that Lutheran worship, while being rich and deep and full of meaning, that if a visitor had no idea what was going on, then it needed to change – that we wouldn’t be, and these are her words, “selfishly Lutheran”. 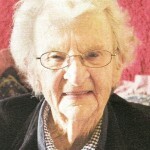 She was 79 when I interviewed her and at that time she was suffering excruciating chest pains which stopped her sleeping. Still, every night, she would pray this prayer. Pray it with me softly if you know it. “Now I lay me down to sleep, I pray thee Lord my soul to keep, If I should die before I wake, I pray thee Lord my soul to take. Amen”. Every single night until she was able she prayed that prayer, and she prayed for us. Grandma relied on God. And why not? We sit here with our fancy phones, and fancy education and think we have it all together, but Grandma soon found out that she couldn’t rely on her brother to keep her safe, she couldn’t rely on Wally to keep her safe, she couldn’t rely totally on Ray, or her family or even her mind. She relied on God. You imagine what it would be like to live in a society where, having a German name, someone tried to burn down their Church in the war because it was German, when your favourite brother and new husband were killed in that same war, fighting FOR Australia. I can see why she relied on God. The fact that she was a good person didn’t matter so much in her relationship with God, because God was always going to accept her, but by hang did it make a difference to us who were part of her life. She was an amazing woman. 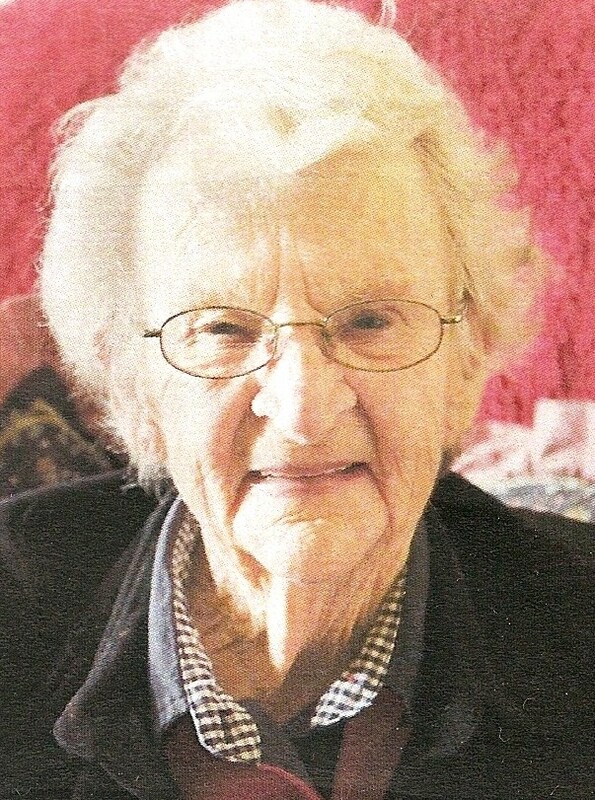 She loved sport, she loved Baileys and ice-cream, she loved beer, which she had to use a straw in the later days – that’s commitment for you – good on ya Grandma! And what about Scrabble? If anyone here beat her in scrabble I salute you! And we spoke of her own death, and at that stage, she had already felt a spiritual battle going on. And you probably don’t realise it, but you know that battle – it’s the voice inside your head that says, “You are worth nothing. You can’t call yourself a Christian with your track record – I know what you have done, I know who you are. You aren’t good enough for God.” And you know what, I can just imagine this 4’11” (and a half!) spiritual powerhouse taking a stand and saying “Nothing can separate me from God’s love. Not doubt, not sin, not dementia, not death, not problems, or chest pain, or mortality…. I know that I haven’t been good enough. I know I haven’t prayed enough, I know I haven’t loved enough – but that’s not the issue. The issue is that God loves me, God died for me, God carries me”. Nothing can separate us from the love of God. This is what Grandma wanted you to know and remember in this very, very sad day.